OK - In the interest of pure, unedited honesty - this is a repost. 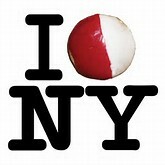 It's not too early to plan your travel future and planning a trip to NYC during Christmas should start about now. So, I thought you might benefit from reading about our experiences in what many consider to be America's greatest urban center. Whether you agree with that is a discussion for another time and another place. I know, I know - You probably don't really want to read about the bright lights of NYC at Christmas time right in the middle of our currently long hot summer. But I have to correct a most egregious dereliction of duty on the part of this wandering vagabond heart. I left out all the cool stuff and my thoughts on all things great and small in the city that never sleeps - not to mention a killer hotel right off Times Square. I got way too busy dealing with all things holiday- kids, the countdown, presents, shopping (ugh!) - and we bought a house - SO, I have posted nil in months. Once again, just like last year, I thought today's post would give at least a virtual respite from that famous Tallahassee heat and humidity. As a close friend and musical mentor who moved to Arizona said upon returning for a short visit - "I knew I was in Tallahassee when I got off the plane and all the air was sucked out of my body". That's what happens when you live in a place that averages about 20-30 percent humidity. Serves him right for leaving God's Country. My apologies to those vagabonds who happen to live in more hospitable summer climes. So this week's post will enter into the official blogosphere record a trip that has been on my bride's Bucket List since we started life together 42 years ago next month - Christmas in New York City - Check! Making a hotel reservation in New York, can be a daunting task. 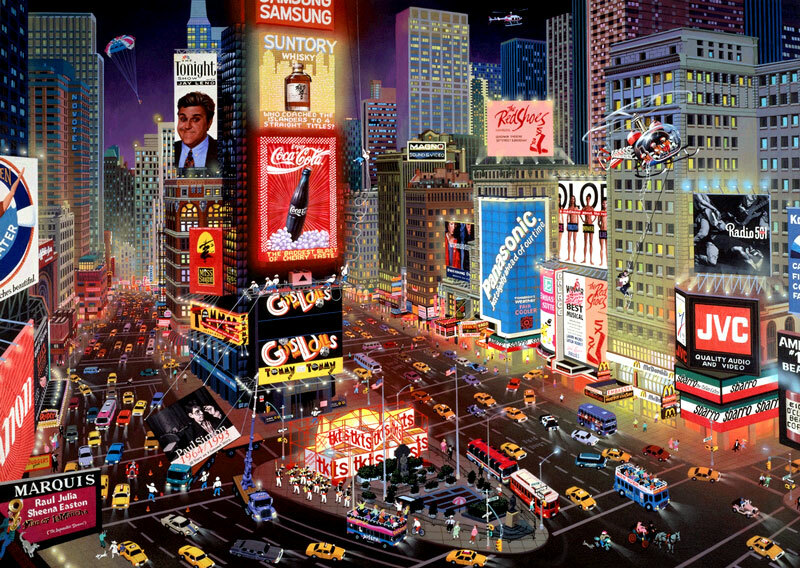 New York may, in fact, have more hotels per square foot than any city on the planet. According to the internet - and you know its true if it's on the internet - 54 million wandering souls visit this city every year. When you toss in the roughly 8 million plus permanent residents, well it's a busy place. Therefore, you want to stay as close to the action as possible, lest a Nomad spend too much time and too much money getting from place to place, particularly when you factor in relatively long waits for taxis - and it's Christmas! After researching dozens of hotels in NYC, we settled on a very small hip place just two blocks off Times Square - ROW NYC. This boutique hotel has everything one needs to rest up from a day of sight seeing or a night on the town. The design motif is pure urban minimalist from the understated lobby-bar-social meeting place to the large graphics in the rooms. Typical for New York, the rooms are not huge, but plenty big for two bleary eyed vagabonds. I recommend a Superior City View Room. It's about the same price as a regular room and you get glimpses of the city that absolutely, positively never sleeps. Our room had a killer view up the 8th Avenue canyon. Concierge Service was very good and helpful with directions, restaurant recommendations/reservations, etc.. One helpful point here - Make your reservation at least two months before your trip and check back often as your departure approaches. We got a reduced rate about a week before our trip via an email offer from the hotel. At Christmas no less- go figure! 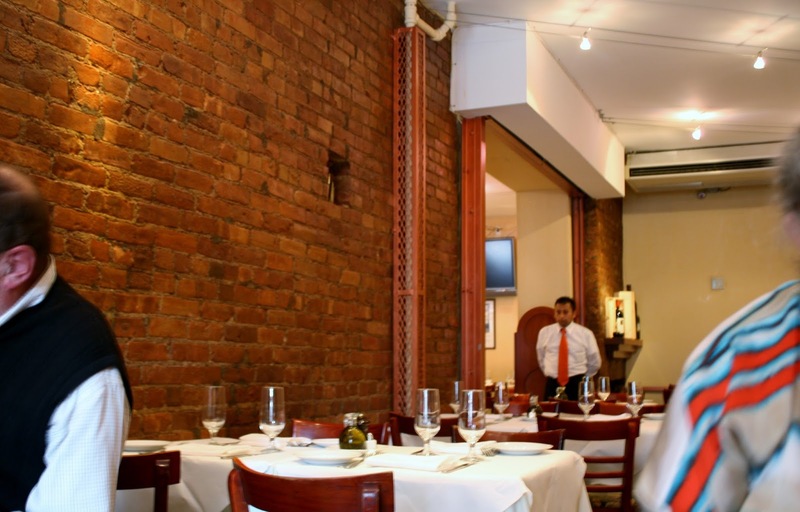 Amarone Ristorante is a secret gem in Hell's Kitchen. This authentic Italian gem offers amazing eats that reflect the owners' Italian background. Again, from my neck of the woods - It ain't braggin' if you can back it up. Amarone backs it up. ATTENTION ALL VEGANS - DO NOT READ THIS! Carnivores, on the other hand, listen up. Upon the recommendation of an in-law, who shall remain nameless to protect her from the onslaught of Texts, Tweets, Instagrams and Facebook Trolls she would no doubt receive from the red meat hating food police, castigating her for recommending a restaurant that prides itself on serving the finest slain bovine on the planet, we made reservations at one of the most unique restaurants I have ever had the pleasure of eating in - Quality Meats. This interesting multi-level eatery, part of an exclusive group of restaurants in New York and Miami, proves that quality really has no substitute. Steaks with every trimming you could ever want paired with a great wine recommended by the excellent wait staff came together like Sinatra and "New York, New York" . 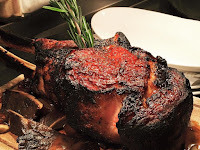 I'm spreadin' the news - Quality Meats must be added to every NYC loving foodie's Bucket List. And kudos to my unnamed in-law. You did good girl. WHO LOVES YOU PRETTY BABY! 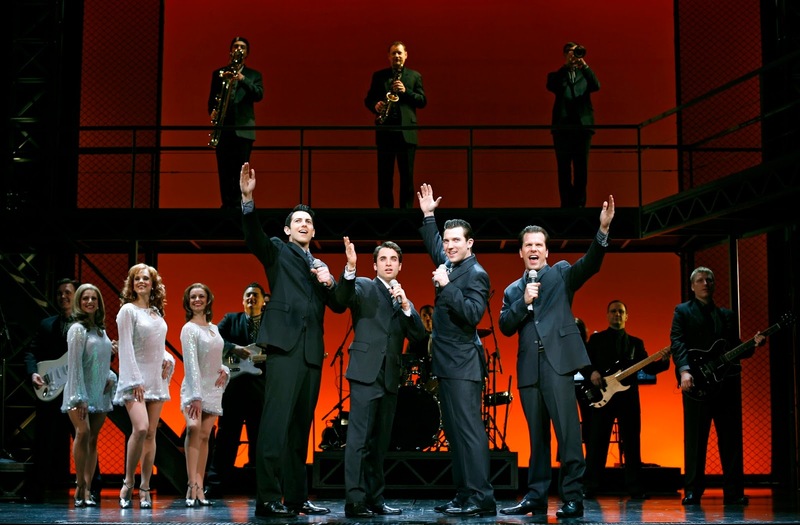 The Great White Way is one of America's great cultural treasures, and after over 1,400 performances,The Jersey Boys has become one of the hottest tickets on Broadway. 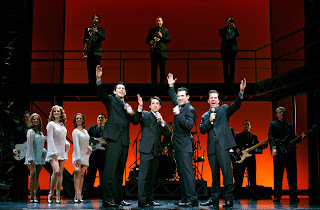 With minimal set pieces, this drama/musical trip about one of America's greatest pop-rock groups, The Jersey Boys captures the true story and essence of the 100 million record selling super group. We so enjoyed the story about this often troubled group with the unique high falsetto front man, Frankie Valli. The stripped down performance in the intimate August Wilson Theatre makes the musical presentation of some of the greatest pop songs ever recorded something to remember. And they sang virtually every hit this Rock and Roll Hall of Fame inducted group ever recorded - Sherry - Big Girls Don't Cry - Rag Doll - ad infinitum. The actor/singer Joseph Leo Bwarie absolutely killed the Frankie Valli role with his voice and the nuance of this complex icon and his even more complex relationship with the other members of The Four Seasons. If you are a child of the sixties, ya gotta go! And drag your kids along so they can see and hear what real talent looks and sounds like. THE NUTCRACKER, THE ROCKETTES, A BIG TREE & MATISSE AT MOMA - WOW!! One of the great joys of visiting a city like New York is the opportunity to see the best of the best. Premiering on February 2, 1954, the George Balanchine Nutcracker Ballet is something that every person, young or old, should see. The music of Tchaikovsky, combined with the genius of Balanchine and the talents of some 90 world class dancers, presents all that is magical about the vision of Christmas. In a world that is growing increasingly harder to understand, this annual Christmas extravaganza brings all who see it closer to the joy and beauty of our greatest holiday tradition. And then we have those girls with legs that seemingly go on forever - The Rockettes. With over eighty dancers, all the same height, this dance troupe has been performing their dazzling choreography for over eighty years in one of the most iconic performance halls in America - Radio City Music Hall. Put simply, The Rockettes are a true red, white and blue blast of pure entertainment presenting Christmas entertainment at its best. And they look pretty good doing it. And there, right in the middle of Manhattan - The giant tree in Rockefeller Center sets the mood for any Christmas visit to The Big Apple. It's very big, it's very bright and it will make you feel like Christmas. If, upon viewing this magnificent sentinel of light, you don't feel like celebrating all that Christmas means - sorry, that's on you. New York is one of those places that forces any Wandering Nomad to make sometimes hard choices on what and what not to see and do. However, one experience any self respecting vagabond cannot forgo on any visit to NYC is an afternoon wandering among the great works of art that adorn the walls of The Museum of Modern Art (MOMA). World class paintings, sculpture and other objects de arte abound in this museum that has been at the cutting edge of modern art since 1929. The special exhibit - Matisse: The Cutouts - must be seen up close and personal to grasp the impact of one of modern art's most compelling and inventive artists. FINALLY - THE WORLD TRADE CENTER - BE PREPARED! 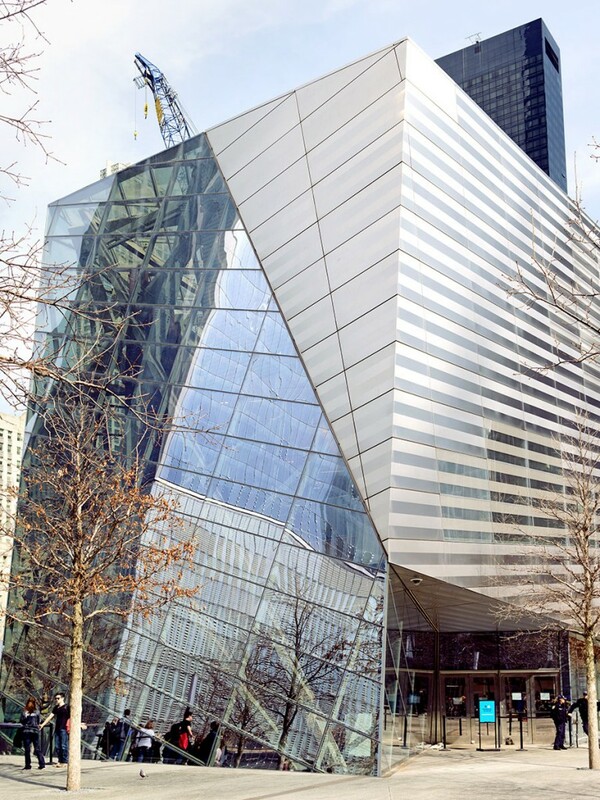 The horrific events of 911 are respectfully remembered in film, architecture and artifacts at The 911 Memorial and Museum. You simply cannot visit this amazing memorial without understanding how ordinary Americans can do extraordinary things when circumstances demand it and the unflinching spirit of America in the face of incomprehensible horror. The gravity of the devastation that took place on this iconic parcel of real estate is apparent as you enter the main plaza surrounding the black sculptural voids of the original Twin Towers with a continuous black granite viewing rail featuring the embossed names of some 3,000 innocent victims who died in this soul shattering, murderous attack perpetrated by people who redefine evil of the first order. Upon entering the museum, you are first given the opportunity to view a film with dozens of world leaders, firemen, police and other ordinary Americans who had some connection with the only attack on our homeland by a foreign entity. 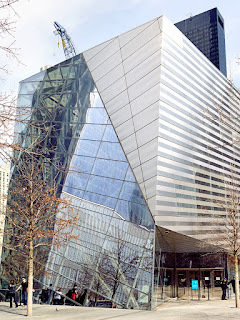 The museum itself, which descends to the lowest foundations of the original World Trade Center subtly features a simple modern design motif by the architectural-design team lead by David Brody Bond juxtaposed against remaining foundations, steel columns and artifacts that render the experience not so much like a museum but more like a continuous visual and emotional journey through tragedy that ultimately gives way to the life affirming power of the human spirit. As we were leaving this place, which so eloquently memorializes the somber events of that tragic day in our history, I looked up to see the gleaming new tower of the New World Trade Center and I thought - God Bless America Indeed.